It's been very very long since I've blogged. I have filmed a few videos here and there, but haven have the time to edit them, as mentioned in my earlier post. I'm really busy, especially since my Cambridge "A" level examinations are coming up in less than 80 days! 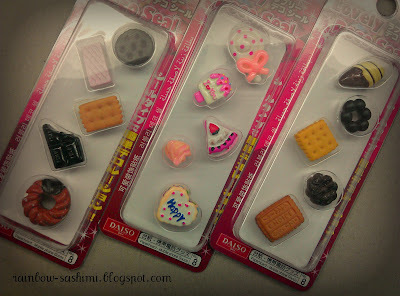 Here's a quick post from me today, about Daiso Deco Stickers! These are sold 5 in a pack for SGD $2! Really cheap in my honest opinion, since each cabochon is effectively $0.50. The quality of most of them are pretty good. I'm comparing them to those sold in Sophie and Toffee. A few of these designs can be found there. I'll make some comparison. Those found on S&T have similar quality. Waffle ($0.70) in S&T has deeper grooves, more detailed. I love you Ice Cream ($0.50) They use to have the pink one, I guess it's sold out. Cake slice ($0.80) Technically it's different colour. Why is it called Deco Stickers? This is because the manufacturers stucked double sided tape to the back of the cabochons! Peel of the top layer and stick it straight on your phone or anything. The tape is pretty strong. The ice cream on my DS is still there. I pulled the ice cream out once in a while cause I'm bored. It pulls off cleanly with some effort and the cover isn't stained with anything. Disclaimer here! I'm not telling you not to buy from S&T. I've purchased from them quite a fair bit. But I happened to chance across Daiso's cabochons and decided to share it. Both have their pros and pros.